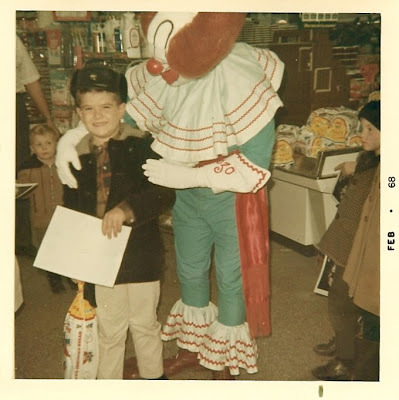 The year is 1968 and young Dave McDonald (known to readers as Slick) is at the grand opening of Feke and Yott grocery store on Ballenger, picking up a free bag of Bozo Bread handed out by none other than Bozo himself. The Feke and Yott was next door to the old Yankee Store, which in latter days became Zody's and, eventually, Rollerworld. With his corduroy coat and matching hat, Dave is indeed slick. Was it really "Bozo Bread"? I thought when I went to the show as a brownie, we got Wonder bread? Gez, is old age setting in? Wow, I remember Feke and Yott, though I only remember the one on Pasadena and not Ballenger Hwy. When I was growing up it was already a Rollerworld. An interesting FYI...anyone ever been to Gracie's Steak House? It's pretty popular. Anyway, Gracie's last name is Yott. She's from the Yott half of Feke and Yott. On closer inspection you can see that that is not Wonder Bread. Wonder has the colorful dots all over the package. Also, I seem to remember Bozo bread from when I was really small. Is that the Flint Bozo? My Mom told me a really funny story about him getting a punch in the mouth from an irate Mother who saw him be mean to her kid. It's not a good idea to be mean to people's kids, they tend to harm you. Yes...it was Bozo bread. I am old but some things you don't forget. The Bozo pictured was Frank Katy who played a variety of characters for WJRT-12. Channel 12 has been playing some old clips as of late...this is their 50th anniversary. I have a hard time imagining Frank losing his cool and being mean to a kid....however I can understand how it happens. Some kids want to pull the clowns nose or squeeze it. Also stepping on a clown's shoes is another favorite. Usually the kids are being encouraged by an adult to perform the abuse. Sorry about being on my clown soap box. Yes, Feke and Yott grocery it was quite a big deal when it opened. I remember it being a strange little market much smaller than Hamady brothers or Kroger but easier to run in and grab something and the meat was great. Velvet is right Gracie was a part of Feke and Yott....the steaks at gracies are great and used to be better when they raised their own beef. Frank Katy was a Sunday School teacher at First Presbyterian Church downtown in the early - mid sixties. It put a nice twist on Sunday morning having Mr.Magic as a religion mentor. I remember him as being a really nice guy though we could not convince him to don the turban and cape. The original Yankee Store, I think, was at Clio and Pierson, in the north face of the northwest-corner strip mall. Was the Ballenger Road store #2, or were there others? Hold on folks. Wasn't it Cady and not Katy? Or am I having some old guy issues? The first Yankee was a spin-off from the downtown Army Navy Surplus Store. Then Joe Megdill? put one on the corner of Dort and Atherton. I think. Then more popped up in different places. Interesting TRUE note: When my late grandfather had inpatient surgery at St. Joseph Hospital in 1980, his roommate was Frank Cady, aka BOZO from Channel 12. He was a nice man, and he also wore a toupee while on air as himself. I guess the Bozo wig covered the hair loss...Mr. Cady's grave is at Evergreen Cemetery in Grand Blanc. Hmm...wasn't there a store at Richfield & Averill called Century City or something that also burned down around that time?